Though the first day of autumn (for the northern hemisphere) was a week ago, it has been so hot here in southern Oregon that it has felt like high summer. To top it off, we have had numerous wildfires in the area, and the valley has been flooded with smoke. Yesterday, finally, it began to cool off and the smoke dissipated. I was able to see the mountains again, and I actually noticed that some of the trees in town are starting to lose their leaves. Today it might even rain! In honor of these changes, I am going to share a review with you. 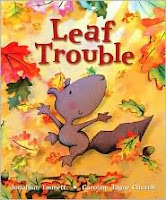 The book, Leaf Trouble, is a delightful title about a squirrel who experiences his first fall. One morning, when he smells the fresh breeze blowing around his tree, Pip Squirrel realizes that “something’s changed.” For the first time Pip sees that the leaves on his oak tree are no longer green. They are yellow, orange and red. The sight surprises the little squirrel so much that he literally falls down to the ground. He becomes quite distressed when he sees that the leaves are not only changing color, but they are falling off the tree. Frantically Pip and his sister Blossom collect up the fallen leaves and they try to stick them back on the tree. Alas, this does not work and Pip and Blossom are a loss. What can they do to save their beloved tree. Through the eyes of a charming little squirrel, Jonathan Emmett shows young children that change can be a good thing. Wonderful things happen as the seasons unfold, and we can both look forward to what is happening now, and we can look forward to what is to come. Jonathan Emmett’s story is beautifully complimented by Caroline Jayne Church’s warm multimedia illustrations, which have a unique three-dimensional component. On September 26th, 1774, a little boy was born in New England who would become the stuff of legend. He was called John Chapman, but he came be known as Johnny Appleseed, the man who planted thousands of trees around the country. Many of us have heard about Johnny Appleseed, the folk hero who, it is said, traveled around the country planting apple trees. The real story of John Chapman is even more impressive than the legends that came to be associated with his name. After his father returned home from serving in the revolutionary war armies, John (Johnny) Chapman went to live in Longmeadow, Massachusetts, with his family. Being the son of a poor man, Johnny was not able to stay in school as long as perhaps he would of liked. Instead, he was apprenticed to a local farmer. Johnny learned how to plant and care for apple trees on the farmer’s land, and he grew to love the trees that are so useful and so beautiful. When he was in his twenties, Johnny decided that he wanted to follow the teachings of Emanuel Swedenborg, a philosopher who believed that people should “do good and spread the doctrine of God’s goodness and bounty.” And so Johnny traveled around the countryside living simply, preaching, and selling people small apple trees that he grew from seed. 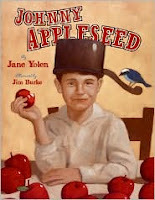 In this delightful picture book, Jane Yolen gives her readers a picture of what the real Johnny Appleseed was like. Though verse and prose she tells the story of a man who was often considered “crazy,” but who loved to travel, to share stories, and to give people apple trees. At the end of the book, Yolen also talks about the legend of Johnny Appleseed. She helps young readers to appreciate that this legend is based on the real life story of a man who did indeed do remarkable things. 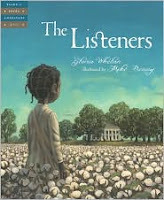 Yesterday I read and reviewed a wonderful picture book called The Listeners. 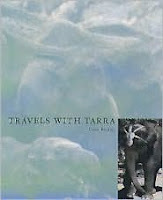 The author, Gloria Whelan, has written numerous books for young readers of all ages. Her books have won numerous awards, and she frequently uses her considerable writing skills to bring the past alive, weaving together fact and fiction to give her readers a compelling story. Ella May has to work in the cotton fields all day and it is hard work for a child. In the evenings she has another important job to do, she goes to the great house where the Master lives and she sits under one of the windows to listen. None of the white folks bother to tell the slaves what is happening on the plantation, so they send the young children to listen under the windows. Then the children report back to the adults about what they have heard. One night Ella May and her two friends Bobby and Sue hear that the Master is going to hire a new overseer “to boss” them. This is good news because the current overseer is a cruel man. On another night Ella May’s father gets a feeling that change is in the air. He tells Ella May that “dangerous times are coming,” and he needs Ella May to listen extra carefully. The news that she brings home that evening is joyous, and everyone has high hopes that real change lies ahead of them. In this powerful and moving book, Gloria Whelan helps her young readers to see what it was like to be slave child on a southern plantation. She also shows readers that sometimes it pays to listen to what is being said around you, because information can be empowering. With a simple text and rich illustrations, this picture book will take readers back in time, opening a window to the past. This is one of the titles in the excellent Tales of Young Americans series. A few months ago a reader called Lydia wrote to me to ask me to correct a mistake that I had made in a review I wrote for the book The Various. She was so charming and sharp that I invited her to write a review of the book for this blog. I was curious to see how she sees the book from her 14-year-old perspective. Midge Walters is just an ordinary London girl who is extremely annoyed with her mother, a violinist in the Philharmonic Orchestra. Time and time again she has pleaded to go with her mother on a tour, and every time the answer is no, and it is no different now. This time Midge is going to stay with her quirky Uncle Brian who lives at Mill Farm. Midge instantly loves the farm and her uncle, whom she hasn’t seen for years. She thinks that this stay will be the same as all the others has had: downright boring. Her cousins Katie and George aren’t going to arrive from their holiday for two weeks, so Midge is completely stuck with what to do, and decides to explore the surrounding fields belonging to her uncle. She is soon discovers how wrong she was; these are not going to be a boring few weeks. In fact they will probably be the most dramatic weeks in her life. She finds an old, desolate pig barn hiding a big secret – a winged horse, about the size of a small deer, trapped underneath the spokes of a raking machine. As she nurses him back to health, she learns that his name is Pegs, and he lives in what she calls the Royal Forest, which is owned by Midge’s uncle. Pegs can speak, but not as humans do. It sounds to Midge as if Pegs is speaking on a strange sort of telephone, she can see the words like pictures and colours, but the sound is all inside her head. Call it telepathy, if you like. Pegs takes Midge into the Royal Forest to meet the Various, a group of five tribes trying their best to survive in times where there is less and less food. Pegs had actually been sent out to seek food or safe land in the neighbouring forests, but all he found was a site full of trucks, diggers and felled trees. The closest word to describe the ‘little people’ would be ‘fairy’, but only one tribe, the Ickri, has wings, and even then they can only glide from tree to tree. They are about knee height but, though they are small, they possess spears and arrows. Some are less friendly than others, and some even try to kill Midge. Midge is dragged into the tale of the struggling tribes, and she is horrified to find out that her uncle wants to sell the land to developers. Pegs urges Midge to tell queen Ba-betts of the Various about this news, which she does. She also finds out about an ancient connection between her and the Various. An ancestor of hers, a ‘Gorji’, as the Various call humans, once built a strong relationship with the tribes, but whenever she spoke of the little people, people thought she was mad. Midge has the task and mission to protect the only home these strange, mystifying people have, all while keeping their presence a secret. This first book in a trilogy about the Various, mixes fantasy and reality so closely that you sometimes wonder which is which. It is very difficult not to get sucked into the plot, and to actually feel as if you are becoming Midge herself. Thank you, Lydia. I hope to have more guest reviewers in the future. Today I will be interviewing Joy Preble, the author of Dreaming Anastasia. Marya: Where did the idea for your remarkable book come from? Marya: Why did you decide to bring Baba Yaga, the Russian fairytale witch, into the story? Marya: Have you always had an interest in the Romanov story? Joy: Yes! I think I was in junior high when I picked up a copy of Robert K. Massie’s biography, Nicholas and Alexandra. I was hooked. There’s just something so gloriously and horrendously tragic about it all. This pretty, pretty family who had everything and then lost it all in the political upheaval of the times. And that crazy Rasputin who was so strong that they poisoned him and then shot him and finally had to drown him to get him to die! Plus of course, Anastasia herself – so young and feisty and funny. I can see why so many people just continued to hope that she hadn’t died in that basement that horrible day. I guess all of the passion of that story stuck with me and eventually it came out as Dreaming Anastasia. Marya: In this story, the power of “blood’ – as in family connections – is strong. Is this something you believe is true outside of your story? Marya: When you began the story did you know it was going to end the way it did? Joy: You know, you’re the first person to ask me that! And if I’m going to be honest, I will say that I very much struggled with the ending, especially the more I got to know and love my characters. For those who’ve read, you know that there are obviously two distinct possibilities for the ending. I did work out how the story would be both ways. But ultimately I feel I chose the ending that made the most sense for the characters. That being said, I will tease you by saying that if I get to write the sequels, you may find more surprises in store. That’s all I can say right now. Marya: You are part of 2k9, a group of writers who are bringing out their first books in the year 2009. How has the group helped you with your book? Joy: Oh my gosh, how didn’t they, would be the better question? I am constantly telling everyone how lucky I am to have these 20 other writers all going through this journey with me. Each and every one of them has become a friend and a writing colleague. We help each other with everything from morale to promotion and all the stuff in between. And when we do get together in person – it’s crazy wonderful. (Okay, Kathryn Fitzmaurice (The Year the Swallows Came Early) may disagree because she had to drive around Chicago with me behind the wheel getting lost and blowing through some toll booths (I didn’t see it; really. That’s all I’m saying. It was dark. It was raining. I’d eaten too much dessert) but beyond that these guys are just amazing! Marya: Are you writing a new story at the moment? If you are, are you finding that your writing process is different this time around? Joy: I’ve just finished two other novels that I hope you will all get to see at some point and I will say that while my general creative process is still the same, I have developed a much more accurately critical internal editor after having gone through editorial revisions with Dreaming Anastasia. The copy edit process in particular was an eye-opener to me. My editor had said, “Oh, it won’t be much. Your writing is very clean.” And then I took a look at what the team had to say… You find out your weaknesses – such as my desire to use too many stylistic fragments and my copy editor’s love of adding dashes. But I did love the discussions we had in the Word comment bubbles. It got quite lively late at night! Thank you Joy for a wonderful interview. 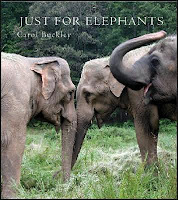 You can visit Joy on her website to find out more about her work and her book. Please visit the other bloggers who are partcipating on this tour.